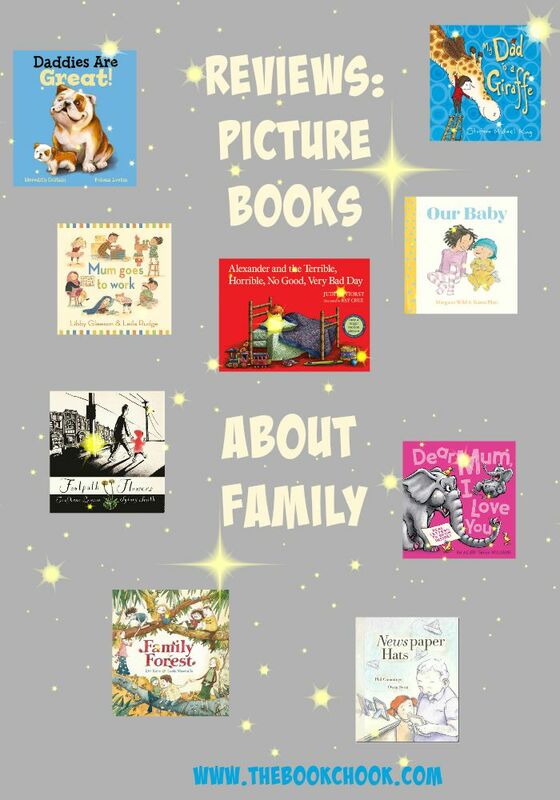 If you’re a librarian looking for resources that support a unit on The Family, or a someone looking to buy a special gift for a child, check out the list below. Though all very different books, they are alike because they're to do with family. Mum Goes to Work: Written by Libby Gleeson and illustrated by Leila Rudge, this children’s picture book was recently re-published by Walker Books Australia (2015) and originally published by Scholastic in 1992. From the publisher: A heart-warming look at the busy days of working mothers and their preschool-aged children. It's early morning and everyone is arriving at the noisy childcare centre. Mum is going to work. "Bye, Mum." What do mums do at work? Are the children as busy as their mums? I’m so glad to see this book has been re-published. It’s a story about the families and activities belonging to children at a day care centre. It would be great to use in a day care or pre-school setting as kids will recognise lots they see and listen to in a read-aloud. Children also get to explore the many different roles played by Mums as they work, whether in stores, hospitals, offices or home with a new baby. There a lovely mellowness to Rudge’s illustrations. Characters drawn include adults and kids of different ethnicities. There are lots of activities and individual elements in each double page to discuss and ponder. It’s quite simply one of those excellent picture books that work very well and deserves a place in collections everywhere. This is a very cute concept that I know will appeal to kids. We meet lots of different kinds of dads, and they are all dogs! Lovsin’s dog illustrations are adorable. Costain weaves a description of daring daddies, caring daddies and ones with snuggly laps, all in rhyming verse that’s great to read aloud. Alexander and the Terrible, Horrible, No Good, Very Bad Day: Written by Judith Viorst and illustrated by Ray Cruz, my edition published by Simon and Schuster UK (2014.) First published 1972. What do you do on a day like that? Well, you may think about going to Australia. You may also be glad to find that some days are like that for other people too. This funny and endearing story has delighted readers for more than forty years and is the inspiration behind the upcoming film, starring Jennifer Garner and Steve Carrell. This is a children’s picture book that certainly deserves to be re-published. Kids from as young as 5 will empathise with Alexander and understand what it’s like to have a bad day. Older primary students will no doubt have their own bad day stories to share! Children will hopefully be comforted by the knowledge that others have bad days too, and that tomorrow may be a GREAT day. Each scenario during Alexander’s day is totally believable: the way his teeth are the only ones to have a cavity while the rest of the family is cavity-free; the way he suddenly drops from best friend to third best friend; the way his Mom forgets to give him a treat in his lunch. When you’re a child these situations are calamities! I love the way Cruz depicts Alexander in colour while the rest of the action is in black and white. It enhances the reader’s understanding of Alexander’s difference and misery, the way it seems no matter what he does, the day can only get worse. I hope you’ll introduce this classic to a new generation of kids, because I’m sure they’ll appreciate and enjoy it very much. The movie tie-in means there are even more ways to extend the literature experience. Some babies have a mum and a dad. Some babies have a mum, and a dad who lives elsewhere. Some babies have two mums. Or two dads. Our baby has a mum and a dad and a big sister - me! Babies come in all shapes and sizes, and from all sorts of families. Some babies have milky mouths, snotty noses, tufty hair, or no hair at all. Some babies like going to cafes, or to the park. Some like playing at home. Everyone of them is different, and every one of them is special. It’s great to see so many books published for children nowadays that celebrate diversity. Children who grab this book have a good chance of finding a family scenario like theirs - perhaps a baby lives with two dads, or shares his home with just Mum. The story introduces many different babies but returns often to the one baby whose big sister is telling the story. Don’t for an instant imagine dull description though! Wild is a gifted writer who loves to share a laugh with kids, and there are plenty of laughs. Blair illustrated Baby Beats and Granny Grommet and Me. I love her style and kids will too. The characters are large and colourful, but with a soft gentleness to them that really suits the book. Kids will enjoy the different perspectives, especially upside down and peeking through legs, and they’ll love the humour as Blair complements Wild beautifully. Footpath Flowers: Conceived by JonArno Lawson and illustrated by Sydney Smith, this children's picture book was published by Walker Books (2015). Here are two members of a family out for a stroll. The little girl wears a bright red jacket, one of the few carefully chosen splashes of colour throughout the picture book. While the little girl notices lots of interesting details during the walk, Dad seems more focussed on his thoughts and his mobile phone. As the walk proceeds, we see more colour and more interactivity between Dad, Daughter and passers-by. I loved the way the little girl gifts others with her flowers, and the theme of giving. Like most good wordless picture books, children will notice more and more with repeated readings. Grab classroom ideas via Walker Books. Open the letters and lift the flaps to read all the loveable letters to these special mums! Join the animals and write a letter inside to your wonderful mum too! There is something instantly covetable about books with tiny letters inside. Dear Mum, I Love You is not a book I would recommend to libraries. Even though I think the publishers have done their best to make the book, the envelopes and letters robust, I just think it will be best bought for a single child rather than hundreds. If your library has a hidden section holding pop-ups or other delicate books, this resource can join them. Kids will enjoy the kooky critters, the puns and especially finding the little letters and hearing them read aloud. I hope it will prompt a rush of tiny letter writing and reading in your family! There’s a companion book: Dear Dad, I Want to Be Just Like You, also by Ed Allen and Simon Williams. My Dad is a Giraffe: Written and illustrated by Stephen Michael King, published by Scholastic Press (2015.) RRP: $16.99. A whimsical, imaginative story about the fun, gentle, tall dads we love, from one of Australia's favourite picture book creators. A little girl reveals lovely facts about her Giraffe dad, many of which bear a striking resemblance to human dads! As usual, King’s illustrations are quirky and delightful, presenting kids with lots of visual details to giggle over while they compare their own dads to giraffes. Newspaper Hats: Written by Phil Cummings and illustrated by Owen Swan, Newspaper Hats was published by Scholastic Press (2015.) RRP: $Au24.99. Newspaper Hats is very simple story, with minimal text and not at all overdone or sentimental. We meet Georgie who visits Grandpa, wondering if he will remember her this time. Grandpa talks of all the things he does remember, and then Dad, Georgie and Grandpa make paper hats, something Grandpa does remember how to do. I loved the way Cummings matter-of-factly presents kids with a family situation they may well encounter, and yet does it in a gentle and understated way. The muted colours Swan uses suit the subject matter - I especially liked the collage of newspaper clippings in the endpapers. While some kids have a family tree, others have a family forest! What I loved about Family Forest is the way the author and illustrator both invite us to share the joy of word and picture play. We see a half sister depicted with half of her missing then restored after the young narrator’s protests. A whole sister on the other hand looks a lot like Swiss cheese. This delightful children’s picture book is a riotous celebration of the diversity of families and relationships, and deserves a place in every school, home and neighbourhood. There are Teacher Notes to support the text at HGE’s website. Next Wednesday, I’ll have a list for you on one of my favourite topics - some Special Picture Books for Kids!